This article, from the pages of Deep Learning and the Game of Go, discusses tree search algorithms and their relevance to various types of games. 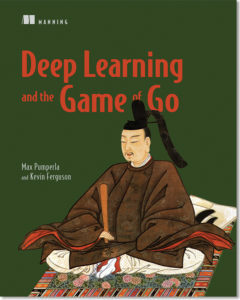 Save 37% on Deep Learning and the Game of Go. Just enter code fccpumperla into the discount code box at checkout at manning.com. What games does tree search apply to? Tree search algorithms are mainly relevant to games where you take turns, and there’s a discrete set of options on each turn. Many board and card games fit this description. On the other hand, tree search won’t help a computer play basketball, charades, or World of Warcraft. We can further classify board and card games according to two useful properties. Deterministic vs non-deterministic. In a deterministic game, the course of the game depends only on the players’ decisions. In a non-deterministic game, there’s some element of randomness involved, like rolling dice or shuffling cards. Perfect information vs hidden information. In perfect information games, both players can see the full game state at all time; the whole board is visible, or everyone’s cards are on the table. In hidden information games, each player can only see part of the game state. This is common in card games, where each player is dealt a few cards and can’t see what the other players are holding. Part of the appeal of hidden information games is guessing what the other players know based on their game decisions. In this article, we primarily focus deterministic perfect information games. In particular, the minimax algorithm generates perfect play for any such games. How can we program a computer to decide what move to make next in a game? To start, we can think about how humans would make the same decision. 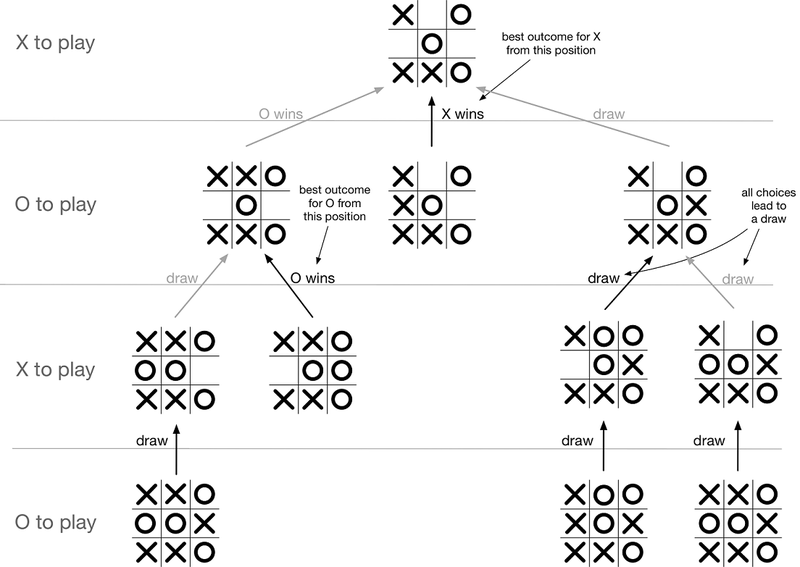 Let’s start with the simplest deterministic perfect information game: tic-tac-toe. The technical name for the strategy we’ll describe is minimaxing (a contraction of “minimizing and maximizing”). You can sum it up in one sentence: assume your opponent is as smart as you are. Let’s see how minimaxing works in practice. Figure 1. What move should X make next? This is an easy one: playing in the lower right corner wins the game. Figure 2 illustrates the hypothetical board positions this function examines. This structure, where a board position points to possible follow-ups, is called a game tree. Figure 2. An illustration of an algorithm to find the winning move. We start with the position at the top. We loop over every possible move and calculate the game state that would result if we played that move. Then we check if that hypothetical game state is a winning position for X.
Let’s back up a bit. How did we get in this position? Perhaps the previous position looked like figure 3. The O player naively hoped to make three in a row across the bottom. But that assumes that X cooperates with the plan. This gives a corollary to our previous rule: don’t choose any move that gives our opponent a winning move. Figure 3. What move should O make next? 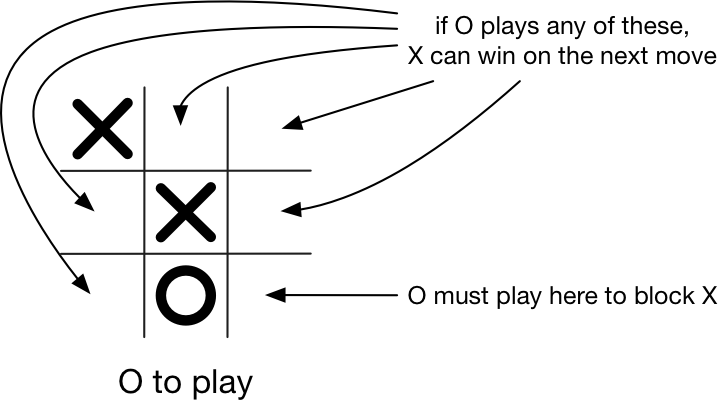 If O plays in the lower left, we must assume that X will follow up in the lower right to win the game. O must find the only move that prevents this. Figure 4. What move should X make? If X plays in the center, there are two ways to complete three-in-a-row: top middle and lower right. O can only block one of them, and X is guaranteed a win. First, see if we can win on the next move. If yes, play that move. If not, see if our opponent can win on the next move. If yes, block that. If not, see if we can force a win in two moves. If yes, play to set that up. Notice that all three of our functions have a similar structure. Each function loops over all valid moves and examines the hypothetical board position that we’d get after playing that move. Furthermore, each function builds on the previous function to simulate what our opponent would do in response. If we generalize this concept, we get an algorithm that can always identify the best possible move. In the previous section, we examined how to anticipate your opponent’s play one or two moves ahead. In this section, we show how to generalize that strategy to pick perfect moves in tic-tac-toe. The core idea is exactly the same, but we need the flexibility to look an arbitrary number of moves in the future. First let’s define an enum that represents the three possible outcomes of game: win, loss, or draw. These possibilities are defined relative to particular player: a loss for one player is a win for the other. Listing 1. An enum to represent the outcome of a game. Imagine we have a function best_result that takes a game state and tells us the best outcome that a player can achieve from that state. If that player can guarantee a win — by any sequence, no matter how complicated — the best_result function returns GameResult.win. If that player can force a draw, it returns GameResult.draw. Otherwise, it returns GameResult.loss. If we assume that function already exists, it’s easy to write a function to pick a move: we loop over all possible moves, call best_result, and pick the move that leads to the best result for us. There may be multiple moves that lead the equal results; we can pick randomly from them in that case. Listing 2 shows how to implement this. Listing 2. A game-playing agent that implements minimax search. Now the question’s how to implement best_result. As in the previous section, we can start from the end of the game and work backward. Listing 3 shows the easy case: if the game is already over, there’s only one possible result. We return it. Listing 3. First of the minimax search algorithm. If the game is already over, we already know the result. If we’re somewhere in the middle of the game, we need to search ahead. By now, the pattern should be familiar. We start by looping over all possible moves and calculating the next game state. Then we must assume our opponent will do their best to counter our hypothetical move. To do this we can call best_result from this new position. That tells us the result our opponent can get from the new position; we invert it to find out our result. Out of all the moves we consider, we select the one that leads to the best result for us. Listing 4 shows how to implement this logic, which makes up the second half of best_result. 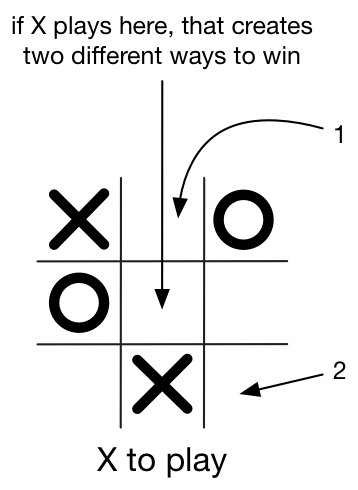 Figure 5 illustrates the board positions this function considers for a particular tic-tac-toe board. Figure 5. A tic-tac-toe game tree. In the top position, it’s X’s turn. If X plays in the top center, then O can guarantee a win. If X plays in the left center, X will win. If X plays right center, then O can force a draw. Therefore, X will choose to play in the left center. ❶ See what the board would look like if we play this move. ❷ Find out our opponent’s best move. ❸ Whatever our opponent wants, we want the opposite. ❹ See if this result is better than the best we’ve seen so far. 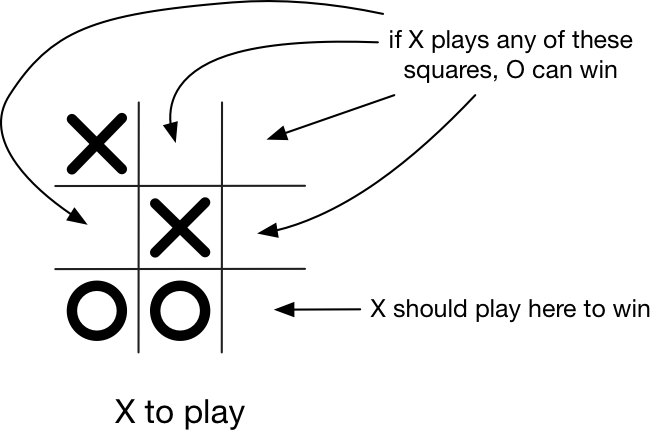 If we apply this algorithm to a simple game, such as tic-tac-toe, we get an unbeatable opponent. You can play against it and see for yourself: try the play_ttt.py example on GitHub (https://github.com/maxpumperla/deep_learning_and_the_game_of_go). In theory, this algorithm also works for chess, Go, or any other deterministic perfect information game. In reality, it’s far too slow for any of those games. To learn about enhancing tree search with deep learning to make game-playing machines, check out the book on liveBook here and see this slide deck.